Ajdabiyah defenses gave way to the forces of Muammar Gaddafi within hours on Tuesday, as hundreds of rebel fighters and residents fled in panic up the desert road north to Benghazi, their cars, trucks, and minibuses spilling into the wrong lanes as they rushed to get out of their besieged town. Trucks with "17th of February army" painted messily on their sides sped up the highway, stuffed with fighters, guns and ammunition. Other trucks and vans packed with women, children, blankets and hastily packed belongings kept pace. Within a few kilometers of Ajdabiyah city limits, some of the rebels had pulled their trucks over to the roadside, seemingly uncertain whether they should wait to fight or continue on to Benghazi, about 160 kms (100 miles) away. "Where is the world? Where is America?" shouted Saleh Layes, 24, a petroleum engineering student wearing desert fatigues and a red checkered keffiyeh. He had pulled over with his friends in their white rebel pick-up truck. They gripped AK-47s. Around 4 p.m., a civilian car swerved to a stop near a cluster of rebel fighters and trucks, who had paused three kilometers north of Ajdabiyah, and said that the eastern gate  the town entrance feeding into the road to Benghazi  had been taken by Gaddafi's forces. Another civilian car driving past flashed its lights and the driver waved his arm frantically from the window, motioning all cars and rebels to move towards Benghazi immediately. Within hours, residents of the city had confirmed that government forces had encircled Ajdabiyah, and there were some reports of fighting in the streets. 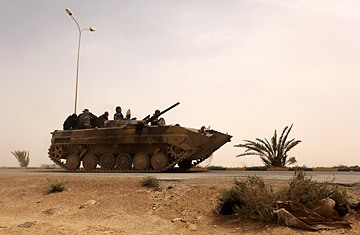 At sunset, young men were massing at a military base on the southern outskirts of Benghazi and soldiers and fighters in army fatigues had formed a few checkpoints on the southern end of the rebel capital. By 9 p.m., journalists prepared to flee, members of the rebels' national council rushed to hold a series of press conferences, and a rebel military spokesman told reporters that the town of Ajdabiyah had returned to rebel control. "Ajdabiyah is totally under control," Khaled al-Sayeh, a spokesman from the national council told a group of foreign correspondents. He said that rebel forces had captured more than 20 prisoners from Gaddafi's retreating forces. And another council member said rebel forces had bombed at least one government ship off the coast near Ajdabiyah. Al-Sayeh invited reporters to join him for a trip to Ajdabiyah to see for themselves. But following the press conference, he tried to back out, saying he had "responsibilities" to attend to in the town, and that other members of the council could accompany the field trip. A hushed debate broke out between a few members of the council when reporters requested to see the prisoners. It would be too risky to transport them by night, the council members concluded. No reporters opted to go on the late night fieldtrip to Ajdabiyah. By 10 p.m., a resident of Ajdabiyah told TIME by phone that rebel fighters could be seen in the streets of the town, and that the sounds of gunfire that had filled the streets earlier in the evening had quieted. Still, he said he believed all of the fighters in view to be men from the town; people who had stayed to defend their own city. The rebels from other towns were gone. Meanwhile, he said, Gaddafi's forces seemed to have retreated to the outskirts for the night. "They may be back in the morning," he said. If so, it would be a repeat of an earlier strategy seen in the western towns of Zawiyah and Zawara, where government forces bombarded, then backed off, and them bombarded again. Still, even as they fled, fighters leaving Ajdabiyah in the later afternoon promised that Benghazi wouldn't fall as easily. "Benghazi won't fall. There wil be street fighting. We know Benghazi, we are from Benghazi. We don't know Ajdabiyah," said Mohamed al-Wurfali, 26, a public health student turned fighter. He was leaving town with two of his friends in a truck with a mounted machine gun. Tracer fire could be seen in Benghazi by late night on Tuesday, and the sound of sporadic machine gun bursts, coupled with honking car horns, and occasional explosions filled the air. It was unclear whether the gunfire came from fighting in Benghazi or from celebration over rumors of an Ajdabiyah reversal. But close to midnight, city residents reported that men were gathering outside the courthouse to celebrate victory in Ajdabiyah. From inside Ajdabiyah close to midnight, a resident told TIME by phone that the bombing had resumed. See the fashion statements of Muammar Gaddafi. See photos from the battle for Libya.